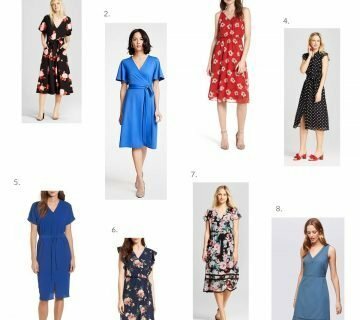 Unless you’ve been living under a rock in blogland this week, then you know that yesterday kicked off the annual Nordstrom Anniversary Sale for cardholders. Since I don’t shop at Nordstrom often enough to justify opening a debit or credit card just to gain early access to the sale, I’m patiently biding my time until the sale goes live to the public next Friday, July 22. 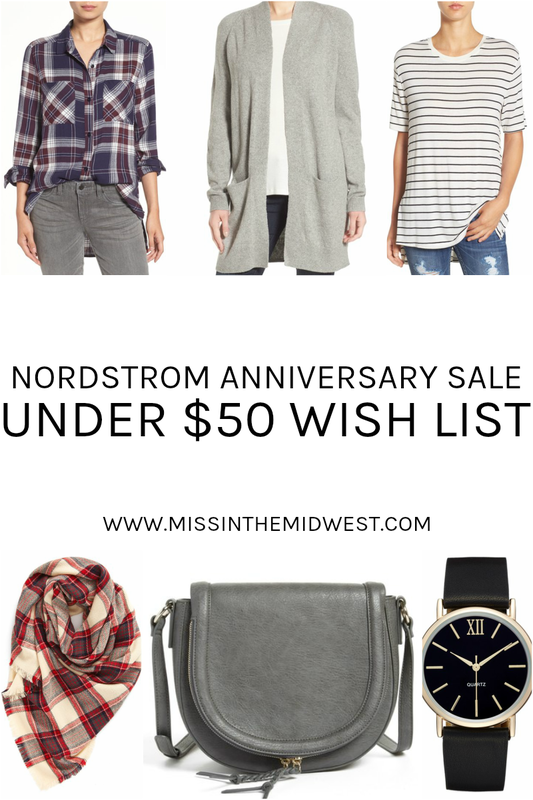 For today, I rounded up my Nordstrom anniversary sale under $50 wish list to share what I have my eye on and hopefully give you ideas for your own shopping cart! The best part of the sale, in my opinion, is the chance to pick up a few items early in preparation for the fall season. While I’m in no way anxious for the warm temperatures to disappear, I do miss fall clothing – jeans, layers, dark colors, scarves, etc. 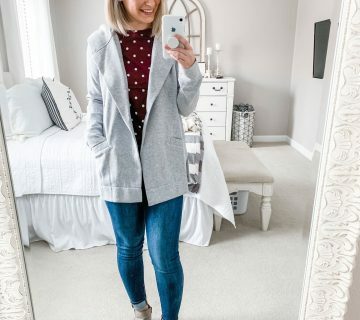 It’s my favorite season to dress for, and some of these sale items have the wheels turning in my head as to how I can style them with pieces that I already own. This tee would be fantastic to wear now and then used as a layering piece under a cardigan and pair of jeans come fall. And, for $15 a piece, you can afford to buy it in multiple colors! I typically like to pick up a new handbag at the start of a new season, and this one from Sole Society has my name written all over it – the dark, muted gray color will go with anything, and the crossbody saddle bag style clearly isn’t going anywhere anytime soon. I’ve also heard nothing but great things about the brand’s products, so I’m sure the purse is good quality for the price. I also have my eye on this black-on-black watch – a watch is about the last thing that I need (I have SO many), but I don’t have one with a black face. For the price point, I can justify it – right? If you’re one of the lucky ones that have early access, have a happy weekend of shopping! I’ll be over here keeping my fingers crossed that everything doesn’t sell out before next week. What do you have your eye on from the #NSale? I want everything you have listed here! That top… you can’t beat top likes that for $15, they really can be worn with everything. And I love the color of that bag, too! Ahh how have I not seen that bag yet?! So cute! Can’t wait to hear what you think about everything! So cute, right?! I’m so glad I was able to snag it! So many good things! I ordered that cardi. Thinking I might need the tee too. I’ve heard that cardi is so great – I can’t wait to get mine! I caved and opened a card this weekend, too! Can’t wait to get all my orders. 🙂 Happy Sunday! 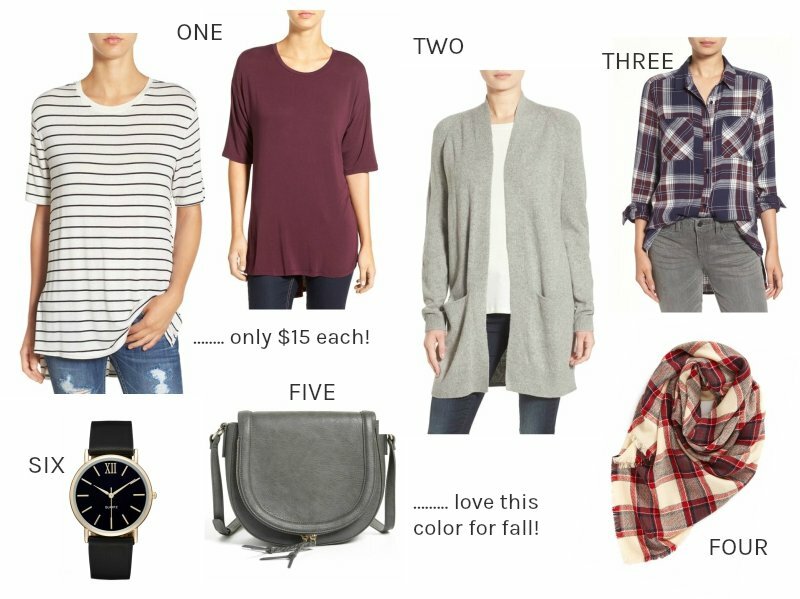 I may spend a little time checking out the Nordstrom sale myself – I’ve never really been a Nordstrom shopper, but based on the cute things you have your eye on, maybe I could find a couple of things too! I think you could! Thank you for the push to open the card so I could do some shopping. I’ve slowly going through everything and adding things to my wishlist because like you I don’t have early access! I’m hoping that the things that I love will last until I have access next week! I love that stripey shirt that you have picked out, and that cardigan looks so comfy! I’ve heard great things about that cardigan so far, so I can’t wait to get mine to see if it lives up to the hype. I caved and got a card, so I’ll be sure to report back on all my purchases! Love your picks!! I shopped til I dropped online yesterday and am excited to look through again and see what gets added during the sale! Hope you are able to get everything you want! I keep checking to see what new things are added, too! So fun! I love all of your picks– especially that open cardigan, I’m loving all the color options they have. I have my eye on a pair of boots that I’m hoping will still be in my size. If that cardigan is as great as everyone is saying it is, I may have to pick it up in multiple colors! i’m not a cardholder either, and i’m not sure if i will be buying anything. i don’t really *need* anything. that bag is super cute though! That bag was the primary thing that I wanted, and it’s officially on its way to me. I was horrible and opened a card so I could shop … I justified it to Ryan that if I shop now then I’ll be set for a few months, lol. Keeping my fingers crossed! I was one of those people that caved and got a card, and it seems like they are restocking stuff pretty quick!